Stick to the truth when confronted. It’s easier in the moment and much easier in the long run. Worry is interest paid on trouble before it falls due, is an old aphorism. Stick to what’s in front of you next week. How can I eliminate stress in my life? I pull out the whiteboard, write STRESS across the top but before I can get my 2×2 grid up, they’ve walked off. I’ll give this to you instead. On one side is Your perceived control of your environment from low to high, and on the other side is your perception of Their control of your environment, from low to high. 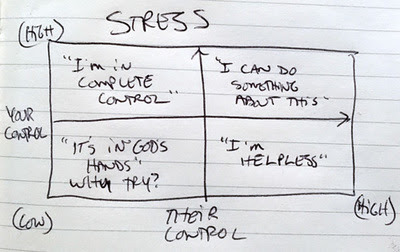 How you perceive control, specifically how much control you have, determines your stress level at any moment in time. If you perceive you’re not in contol and they’re not in control, then it has to be in God’s hands, right? There is not much stress there if you give yourself up to that idea. If you perceive high self control and low external control, then you’re the god. The world responds to you. . .until it doesn’t, creating stress as you fight it. If you perceive high external control and low internal control, that’s another high stress situation because things just happen to you. It’s that high perception of self control and recognition of their control where stress is your friend. I gave a talk to a board last night and we talked about the creative tension of the Yin and the Yang from the Taoists. That is where stress is productive. I don’t advocate eliminating stress from your life. It’s part of being human. Just be aware of your perceptions of who is in control of your stress. I don’t remember if I’ve mentioned his name before, but early in my career I worked for a wonderful gentleman I’ll call Mr. Carl. He was a fountain of wisdom, much of which went over my head but some of which has become the foundation of what I think about business. My strongest memories from Mr. Carl have nothing to do with his business advice, it has to do with his swearing. It was legendary. Famous for being filthy and descriptive, but he never seemed to use actual swear words. One of his milder descriptors in his swearing was the word “dirty,” as in “that dirty,” or “you dirty,” etc. It cracked me up and still makes me laugh. Next week, try it. If you’re having a hard time imagining how to use it, mutter “you dirty, dirty. . .” under your breath. The muttering is important. It’s an instant stress reliever. Is that a Marketing Qualified Lead or Sales Qualified Lead? How Do You Overcome Price Objections?